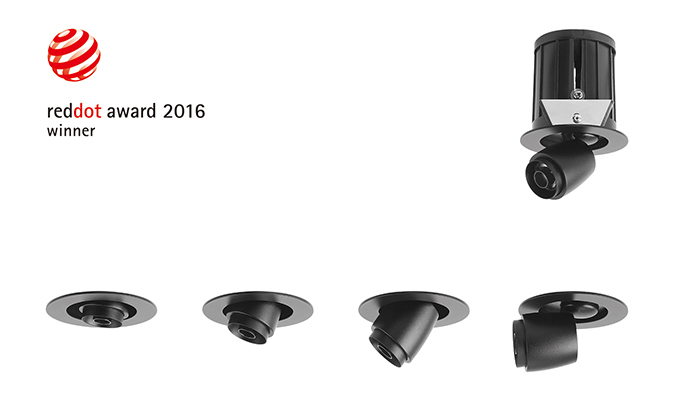 RedDot Design revealed the winners of 2016 at 11 AM (Germany time zone) on March 7. Mini Hatter is a bifunctional display lamp, the size is around a 2″ recessed downlight, it features a top hat contour with one intuitional pullable lamp which can fulfill different tasks- pull in as a 36° downlight with high cut-off angle; pull out as a flexibly adjustable spotlight which can swing 90° upside down and 355° rotatable. The lamp is available in a variety of beam angles: 8°, 12°, 24° and 36°, satisfied general and specific needs, such as residential, business and museum display lighting. Combined its supreme color rendering LED, subtle light shape and anti-glare accessories, Mini Hatter is able to storytelling the history by lighting up the texture of relics with pleasant visual comfort for audiences. In 2015, this product series is largely applied in display cabinets of National Palace Museum in Taiwan. Mini Hatter is a smart and creative display lighting solution.